To make life even easier, here is an awesome recipe for BEEF FAJITA’S that will definitely make your taste buds smile! Salt, pepper, red pepper flakes- 3 dashes each. Mix all ingredients together and let marinate for at least 10 minutes, longer is better. Cook over medium heat until desired doneness. Serve with tortillas, cheese, tomatoes, avocados, sour cream or whatever your heart desires. Oh and trust me about adding the beer, my husband thought I was crazy when I made these for him the first time….needless to say he realized it was genius and puts the recipe over the top! This is a great recipe that you can add or subtract to depending on what you like. I hope you enjoy! Seared and Stuffed Flank Steak….Don’t Mind if I Do! Tonight I tried to test my culinary skills and found this AMAZING recipe! It was easy AND delicious….my kind of recipe! I even created a little YouTube video for your viewing pleasure! Cover with foil and rest for 5-10 minutes before serving. We enjoyed this with Edemame, a fresh garden salad and a roll. What a way to end a fabulous Tuesday! I have to give credit to the place I found the recipe, check them out here. Be sure to check out our blog and our products page for specials! Spring is in the air! We are so excited for the April Specials we are offering! Pikes Peak, Chuck, Rump, Round, Sirloin Roasts-$5.50/lb. Are you looking for a good Easter recipe using Colorado’s Best Beef? Here is a Rib Roast Recipe that looks quite tasty, and very easy! Let us know if you try it! 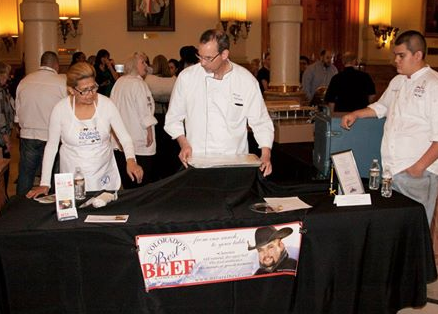 On another note, Colorado’s Best Beef donated meat for the Farm to Fork Culinary Competition at the State Capitol! The Ag Day celebration lunch served hundreds of people and featured Colorado meat and produce. Colorado’s Best Beef being used at the Farm to Fork Culinary Competition. We are always excited to take part in events that help promote agriculture and it’s importance!